Mga ilang taon na ba ang lumipas? Para maaya ko siya sa labas? Sa pag-amin…at sa pag-asang siya’y maging akin. Ang tanikalang ninais ko na kumalas. I wonder how other people became able to draw people precisely on their sketches. Some were maybe professionals and it was understandable that the feat was a product of training and experience. But to those who never drew precisely previously, how did they do it? What willed them to portray the intricacies of their subjects into vivid lines and shades of graphite on paper? Do they smile as they find what themselves have drawn resembling their model? What kind of emotion did they use to be able to perform such task? Is it admiration? Or affection? Or love? I knew that it wasn’t easy to draw somebody, even the ones you love. Love was not enough in my case to force myself into drawing somebody. I have started to do attempts since 2008, with Leah Julian or Mikee Dalumpines. I just can’t back then. There has to be a certain emotion that an individual needed to be able to perform this task. I just don’t know back then. In the first place, why I have been doing this? It was until I saw my dormmate, Ian Biagtan meticulously sketching one of his crushes, that I’ve found my answer. Even though the task was arduous for him, which took him weeks to finish, he was in glee all the time. What sustained him was the thought of showing it to the model herself, which made him gleeful. It was with that thought that I attempted again. I kept hoping that she would get to see this drawing that I made, as I was hoping for the subjects to my write-ups to read what I wrote for them. I kept thinking on the possible reactions if she happened to see this sketch of mine on an olso paper, which was beginning to resemble her. Her images were becoming ingrained into my mind as grains from the graphite stick themselves on the paper precisely where I wanted them to be. The last task to be accomplished was finally drawing her eyes. It was the most difficult task, for the eyes were the windows to the soul. It was as if I was putting the sketch of mine into life with her soul being incorporated to it. Her eyes kept melting my heart as it kept throbbing. If felt that even this sketch of her was gazing upon my soul, naked against the warmth of her presence. After three day, I finished it. (I showed it to my classmates in Chem 16 class, notably, my groupmate, Frederick Jaysol Tandoc). I was eager to show it to the girl, therefore I brought up to her the idea of touring me to her hometown in Bataan. It would be the token of my love confession for I believe that it was the invigorated heart that willed this amateur left hand of mine into making this masterpiece. I loved her. That was why I was able to draw her. It was an indication on how pervasive and vivid she was in my mind. And yet, she was not able to come. I was contemplating in her hometown’s church on what to do with this sketch of her. It was maybe my final concession of defeat to being heartbroken, leaving the drawing at the front aisle seat of that church. For maybe 3 years, I was in a state of depression, thinking of the what-should-have’s or the what-should-have-not’s. I kept drawing her as a consolation. The drawings of her were piling up, but the feeling was incomplete. I was nowhere near the closure that I was expecting. It was until I accidentally met her at the UP Main Library that I’ve found a way to get rid of the burden, by leaving the drawings at the UP Main Library. But things got complicated. My colleagues from my organization have found out that the girl was working as a student assistant in the computer room of the General Reference section of the UP Main Library, after busting out so suddenly, when I realized that she was the one at the counter and I was the next one that she would be serving, in their presence. That was their first time seeing me getting flustered because I was typically acting detached to them. Suddenly, they were beginning to hold our org meetings at the main library. They wanted to see more episodes. I tried ditching them, assigning to my colleague, Leonard Burdeos, the task of leaving the sketches to her, but still they’ve found a way to force me to go. They told that they won’t be attending the duckpin bowling tournament that day unless I would be present at the meeting there to assure their attendance. I went there, but much to my horror, the librarian guarding the door switched with that girl moments after I went in. My colleagues were laughing their hearts out as they saw the uneasiness and tension in me building up as they were anticipating my first interaction with that girl after 2 years. I was more horrified when Leonard came. That girl inspected his bag. Right after her inspection, he pulled out my sketches of her from his bag as he walked towards the computer room with a determination that he would accomplish his task, no matter what. I ran frantically on the pathway to stop him before he entered the computer room. I managed to stop him. Still, I couldn’t find myself going out, with her by the door. I was already 45 minutes late to the tournament that I would be participating. Thankfully, a librarian switched place with her just at the nick of time before I was supposed to throw the opening ball on the tournament. I returned the following week, with no familiar faces around, neither hers. I found it as the perfect time to leave the sketches beneath one of the keyboards of their computers. It was a cowardly act, yet it delivered the closure that I was waiting for, which did not last for long as I discovered another plank to be driven to my heart. I’ve drawn others, who became my crushes, like Erlyne Santiago and Kimberly Arriola, to keep me inspired even though the depressing factors and influences were in full throttle. I was also able to draw Jeshea Faye Abo-abo, who was my girlfriend that time. Also, I was able to draw her friends, much to my confusion. Now, I realized that even though I was not in love, I was still able to draw. That thought of showing the model what I drew of her was the remaining condition or thought that drove me into drawing. Choco Nery, a person who was once special to me, was first one that rendered a drawing of me. Yet, I wasn’t able to return the gesture. Maybe by the time that I was attempting it, the drawing was meant to be a token of reconciliation after throwing a fit of jealousy on her. 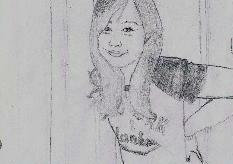 The penultimate sketch that I was able to draw was of Nikka’s, and that drove me into testy waters of public opinion. I just could not do it for a long long time, through Shella, through Karla, through Therese, and finally through Jezel. I just accepted that time, that I lost my chance already to love again. Then came Telle-chan. Some years went back to me as I was feeling invigorated with this affection of mine to her. I regained my drawing sense. After a year, I was able to draw somebody again. Chills met my spine as I basked upon my artwork. It was one of her profile pictures that was nowhere to be found now (I don’t know why). I kept thinking out scenario when I would be giving it to her. In my mind, there were only two possible reactions or response: one was that she would be glad, as simple as that; and the other was that she would be crept out. (Click here to know what really happened in reality). One thing was for certain, it would be my token for a love confession. I was decisive again. Yet, that internal conflict was still what made me reluctant even more, even though I was already determined to give the drawing to her. Even since she came to my life, words began to associate themselves with their respective antonyms. I was happy that she brought me back to life again, yet sad that the distance between us never seemed to shorten. I was optimistic into looking forward to our conversations, yet pessimistic on the thought that these conversations would end someday. I was determined to pursue her, yet so reluctant for I might lose her in return. I was expecting to be in content on being disappointed again. Love brings me joy but brings my heart to the wringer. Come to think of it. How come that a person that seemed to be forever distant came so close to me? My heart was beating so fast to know that it was her who was more eager to spend more time with each other. My heart beat again when she initiated a conversation out of nowhere. My heart burst in joy when she asked me to spend the whole afternoon on the media services room at the UP Main Library with just the two of us. Euphoria was served when she was the one looking forward to our trip to the National Museum which was a date in my perspective. Moments where it was just the two of us gave the feeling that we were indeed the only two people in the world. Then, what I have feared had come true. People who get too beautiful, like the stars in the sky, were meant to disappear someday. We began talking less. It was right after my indirect confession with that poem engraved on the back of her drawing. Maybe that put her on a tight situation. Maybe she just wanted to have a senpai who would help her adjust to the environment and culture of UP. It was maybe her intent all along on approaching me. I misinterpreted again. All of these noises put me into confusion. I knew how hard it is to make a sketch of somebody. What kind of feelings was she conveying to the sketch? She said that she was being a hopeless romantic when she drew it. Why it should look like me? What was her intent? Is it just to return the gesture? Or was it something else? How many times do I have to give up? How many times do I have to raise my hopes again? How many times do I have to be disappointed over and over? How long do I have to contemplate? She was not providing me an answer as she kept ignoring my messages. Did she really draw me, after drawing me out of my slumber over and over again? This is what you might see when I am gazing upon you, when our eyes met, and when you got my attention. But unfortunately, you would be seeing me lock eyes with you hardly. The life in my eyes were gone. It is not that I have gone blind. But my eyes are not conveying anything anymore. When two people look into each other’s eyes at the same time, it is called eye contact. It has been one of the tools of humans in communication, which is not verbal, yet has a big and complex influence over the social behavior of people. We can interpret many things. We can interpret the person’s emotional state using eye contact. Eye contact can communicate sadness, confidence, fervor, joy, rancor, and other various emotions. And sometimes, eye contact can trigger love. Love at first sight is always deemed ridiculous and is often treated as a mere cliche. But love triggered when eyes met is maybe more believable. It happened exactly six years ago, August 12, 2010. Remove the cat-furred mustache, and you can imagine easily how I looked 6 years ago. It was rainy like this day. The spell of rain brought haze in the campus, as if, the university was being hidden by nature against the disruptive pollution brought by the surrounding urban areas. I was a lively political science student back then. I was just being brought out from being an introvert by my dorm-mates. I was beginning to conquer those days with glee, as I began to comfortably mingle with my classmates, regardless of age. Even though I was mingling with people, I knew that I was still detached inside. Their interests don’t always match with mine. Some of my interests were regarded as either geeky or eccentric. But my will was never wavered with these differences. I treated my social detachment as how I do my ordinary, since that was how I became stable. But once in awhile, right in the middle of my stable life, love gave me a magical tale. Since when was it said, that from all great things some part of it had to be lost? Gone. It is all gone. All that I have worked hard for. For the last four years, I have only been dedicating myself for the betterment of that establishment and of the sport I love. I have let myself live in solitude, away from my batchmates and away from my own pursuit of happiness. You were the catalyst of all these things that I have been doing. I wanted to keep myself busy for these four years because I knew that on the moment I was given time to contemplate, I could only think of you, then I would then be aware of my own sorrow, the one that I self-inflicted through you. Gone. All gone in flames, maybe that was why the place wanted me to stay there, even for just a nap. Maybe it was its final goodbye to me. I was so exhausted that day, after playing billiards to gather my thoughts which were shattered by the sight of Nikka holding hands with another. I was so frustrated yet so determined. The sight of her give a duality of feelings: one is obviously frustration and second is a long-term determination. That determination was same to that what I felt on the news of Ms. Tiffany Uy graduated with the highest weighted average in the post-war era. Both of them gave fervor to pursue my goals, which at this time is four: one is to be an excellent researcher who will be known for my contributions in the field of meteorology and wind engineering, two is to excel on the remaining subjects of my bachelor’s degree and then clinch the top spot in the incoming May 2016 board exams, three is to be a formidable competing pool player, and four is to leave a lasting legacy to my university, University of the Philippines Diliman, through the organizations on which I was one of their founders, UP Pool Club and UP Student’s Circle of Duckpin Bowlers. That determination roots from the passion to be them to be honored to have known me in the future. For the first one, my thesis entitled “Estimating Typhoon Haiyan’s Wind Speeds Using Windicators” took the attentions of PAGASA and the Philippine Engineering Journal. I developed methodologies in incorporating forensic structural engineering to meteorology. With that, I estimated Typhoon Haiyan’s wind speed to have a 10-minute average of 290 kph and 1-minute average of 351 kph with a minimum central pressure of 872.2 mbar, 2.2 mbar higher than Typhoon Tip of 1979, the storm that I have been looking up for years. 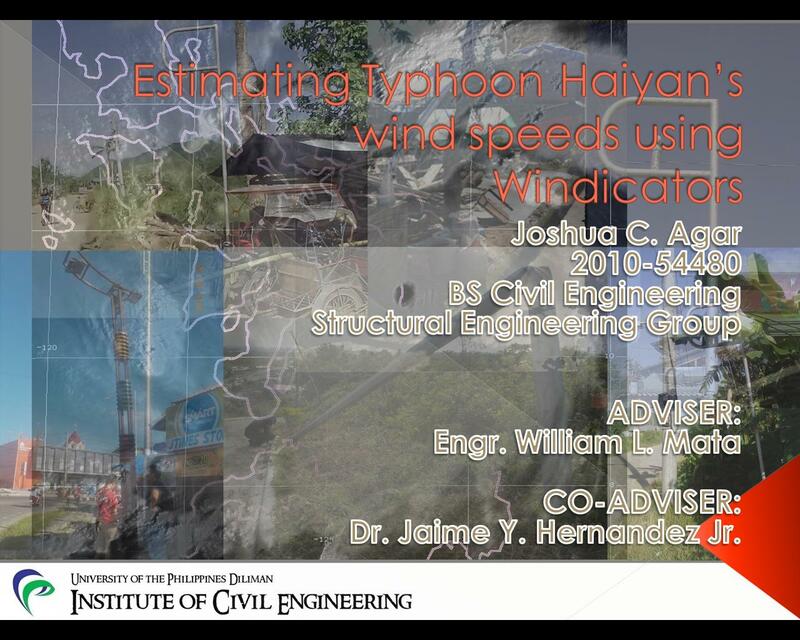 If things will go well, I will present it to the Association of Structural Engineers of the Philippines (ASEP). If I have done well on that part, the building code might change. For the second one, I was using the midyear term to advance-study the subjects that I will be taking on the first semester. For my whole stay in the Institute of Civil Engineering, I have been settling for mediocrity. I felt people were looking down on me especially with the fact that I am resisting to join any academic student organization up till now. It is time to prove to them of my principle which I am holding up till this moment: To not rely on others. For the third one, despite having a tight academic schedule, I was still able to find spare time to pursue my billiard career. I was already planning to join the tournaments to the other billiard organization I was affiliated to, the Star Billiards Foundation, and eventually the qualifying tournaments for international billiard competitions. Back then, I was setting a benchmark to break Stephen Hendry’s record as the youngest world champion in order to pressure myself. But I turned 21 already, and that pressure was gone. But thank God, I was able to find motivation again because of Ms. Uy. And the fourth one, which was the most complicated. My term as president of UP Pool Club was supposed to end on the 31th of October 2015 with the thought of me already removing the barriers in order to not only secure the legacy of UP Pool Club but also of the Student’s Circle. The last barrier of me achieving that is of the UP Duckpin Bowlers Club. The core members of the orgs agree with me we have to wrestle away the administration of the establishment from them, which is an illegitimate organization, not recognized by UP and SEC with no written constitution. They have been using some revenues from the bowling alley and billiard tables which our organizations were trying its best to increase, to their leisure activities which is not related at all to UP. Our requests for proper ventilation, table maintenance and refurbishing always fell into deaf ears. I have lived through the humiliation for one year in order to gather evidences for the formal complaint we would be filling against them, even though my organizations were trampled upon. Some of my members lost faith in the situation. Some of them told me to wait. But I couldn’t wait anymore. Right before the fire, I was already finishing up the final contents of our formal complaint. It was 5 pm in the afternoon that I stopped playing. I have been complaining deep inside on why both sides of my brain are hyperactive, with the left side hungering for more knowledge and the right side itching to create artistic content. Others may have argued and pointed that I should be grateful. Well, there was one time that I have been simultaneously writing some parts of my thesis while doing the lyrics for the Filipino adaptation of the Les Miserables Musical, and it was no simple deal! I just wanted to sleep, and I did. I woke up around 7:30 pm and I have realized that I have been drooling on one of the benches of the bowling alley for two-and-a-half hours already. I stayed there for a little while, ate Kuya Arce’s pulutan as they were drinking liquor. And as usual, I kept myself away from drinking alcohol. Around 8:00 pm, I went home. Re-read Jose Rizal’s Indolence of the Filipinos which I last read about 8 years ago. And then I fell asleep. That night I dreamt about Kim. Kimberly Shayne A. Arriola. One of my blockmates when I was still a Political Science major. I happened to met her in front of the College of Science library, last Monday. My past experiences with her led me to believe that destiny exists. That meeting last Monday was purely coincidental. I was going to the infirmary to have my infected foot treated, and it was too arduous for me to walk on that condition. And so I waved to a UP Ikot jeep. When I was about to board the jeep, I noticed that the jeep was almost full and it would be hard for me to ride that jeep. I let the lady behind me to board to the jeep, while doing my trademark hand gestures in the process. I immediately recognized that lady who happened to be Kim. That meeting was short of greetings yet was so heartfelt on my part. I never thought that a meeting that coincidental would have my heart beating again. Just like the first time we coincidentally met. 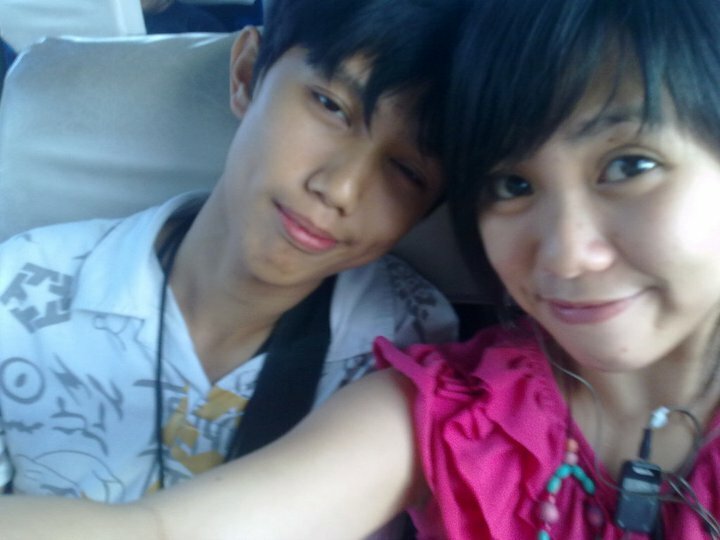 2011: I was living around Espanya Boulevard around that time. It was that one time I was already aboard a bus when I saw a fine lady who registered a recognition from my brain, which I don’t know why. The konduktor of the bus took remark of her beauty and told his driver that he would give a discount on her. I knew back then that it was her. I kept looking back to her to confirm, as she was to me. I immediately used social media to contact her to confirm our meeting. She did confirm that she was the one on the bus. I and her began our conversation, finally ending up in the exchange of numbers. Her text messages were always melting my heart. I was more happy receiving text messages from her than from you. I was invigorated those days because of her. I waited for her everyday at MiniStop on the junction of Espanya Boulevard and Blumentritt Road. I have never felt more at home as it was to her. Those fateful days arrived when she invited me to a lunch date. At her first invitation, I was not able to attend the meeting because I was not feeling well. At her second invitation, the bus I was riding it busted its tires, therefore, I could not attend the date again. And on her last invitation, the bus was unfortunately stopped by a traffic officer for violating traffic laws. I was able to arrive as she was about to leave on the place. But out of disappointment, she told me that she would look for another date with a different person. That dream I had last June 30 was a peculiar one. She has been interrogating me whether I like her or not. She has put me on a tight spot. I had a hard time admitting it. Because when I did, two years ago, she sent me a very long text message on which I was unable to read. I still don’t know the contents of that text message until now. The rest of the dream was just cuddling with her. That dream reflected on what I have been wanting on a relationship, a relationship full of cuddling, hugging and holding hands. It was that simple, like a high schooler. That dream was so good that I overslept. My notifications in facebook were exploding. And when I read them, I was stunned to see the place that I was on last night is reduced into ashes. Memories came running like when I lost to my rival Michael Vizconde in the tournament on which I was the defending champion last September 30, 2013. I lost 12-13 despite being 12-9 up. Michael was able to clinch the last four racks, with the final rack leading to my blunder on the final ten-ball. I missed that ten-ball leaving Michael with an easy shot on that ball. I attributed my lost to the loss of concentration because of the sight of Michael’s girlfriend, which was my long-time crush on our Institute, Jessica Junio. I remember it was when I was 7-4 up that Jessica arrived. I was stunned. I was struck with a dilemma on choosing whether to impress Jessica by beating her boyfriend or whether helping my friend Michael on impressing Jessica. My inability to make a decision ruined my concentration. One of my members, football varsity player Rogelio Maglinas came to watch parts of the match. I have been hinting him on how I was losing concentration because of Jessica, who has been videotaping the match. I finally lost, and the feeling of losing took a time before sinking in. Apart from my crushes, the only instance that involved my pursuits of love was when the girl I was courting for a year, Ma. Erlyne Santiago, went there to say her final goodbye, before immigrating to the United States. Erlyne was my classmate in the NSTP classes. She was the one who swayed me from my pursuit of Myrtle. I have been chasing Erlyne around much to her dislike. I have been doing that because I was anxious on what her thoughts about me were. Just what Erlyne did on my pursuit to Myrtle, that was what Kim did on my pursuit to Erlyne, and what also Faye did on my pursuit to Kim. Kim and Erlyne’s cases were cases of me changing hearts. On Faye’s case, she was the one who made the real first step. I gave Erlyne a sketch of her. I remembered the first thing that she complained was me highlighting her eyebags in the sketch. Mount Makiling will always give me a thought of her. Because that was the place I shared one of my treasured memories with her. After a long day of trekking, most of my group, including Erlyne, were doing inuman. I was keeping myself away from vices (I still do), therefore, I went to bed early, not to sleep but to contemplate. I suddenly felt someone who joined me on my bed, and much to my surprise, it was Erlyne, intoxicated already. I was just still for five minutes, unable to think of something to do. But still, those five minutes were one of the memories I will never be able to forget. Damn this eidetic memory of mine. I remember her almond shaped eyes looking at me. I remember her cheeks that became red because of alcohol. She was just like the teenager’s version of Korea’s Moon Chae Won. I finally uttered a word, and invited her into card games. After she made that goodbye, which happened a year after the instant, I made the same sketch again to keep for myself. That sketch at the moment is at the hands of my Finance head on UP Pool Club. I am sorry that I went too far on my segways. I am just finding something to cheer me up in the midst of these mishaps that came crashing in front of me. To be honest, I was devastated. It has been four months since Kuya Jun Rosaceña, who was my fatherly figure on the last five years in UP, passed away, and now this has happened. 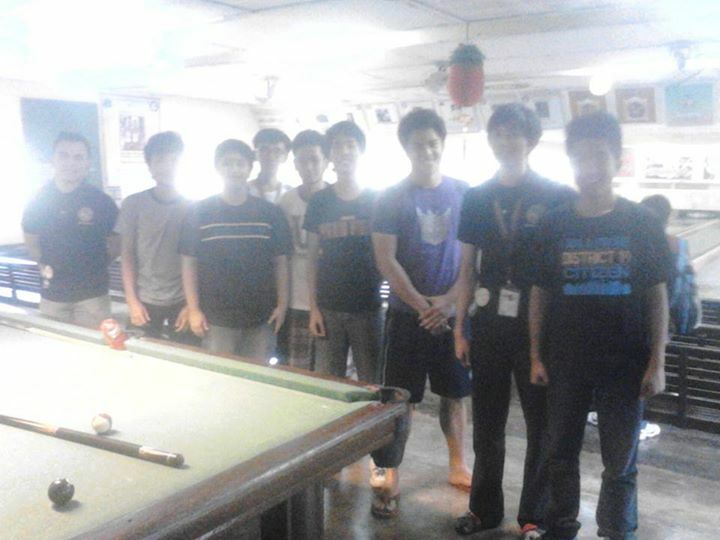 I was never able to fulfill my promise to Kuya Jun to let him be his manager on the money games in pool. That was the place I felt was my second home, where I stayed for two years and have been playing on for five years. I was not able to fulfill my promise to Kuya Alex, Kuya Ayo, Tita Marjea and the members of UPEBA, to eradicate all the cancer that the UP Alumni Center has and to expose the atrocities committed by UPDBC. I was not able to fulfill my promise to Arjay Mercado to submit a draft of the formal complaint. If I revealed them on an earlier time, this fire would not have happened. I can all blame this to myself. If I was able to wrestle away the management on an earlier time, I would have made the establishment be refurbished along with the pool tables. I would have them expelled from the Ecological House. Bygones are bygones. It has already happened. 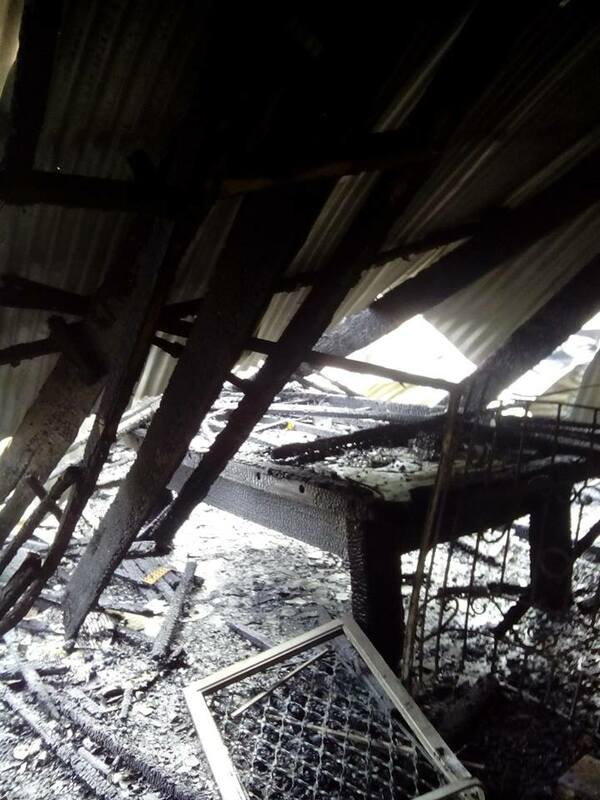 My failures as leader have attributed to that fire; therefore I will take full responsibility to the incident. I have to carry my orgs through this. If I were to succeed, it would cement my legacy to those orgs and those orgs would leave a lasting legacy. I have to succeed. I won’t accept failure at this point. Therefore, as president of both orgs, instead of letting the members do the contents of my final will, I will do it myself. I will be spending more energy for the proposal of the new recreation center. I hope by the end of July, I would have submitted the proposal to the UP Chancellor. I have to impress him and the Board of Regents. Two big-time fraternities failed already. Failure in my part is not an option. Maybe, that was one of fortes, to channel my frustrations into determination and fervor.